Blacklight Media Records' Chris Santos comments: "I could not be more excited to announce the very first Blacklight Media Showcase! To say this is a lifelong dream come true doesn't begin to articulate how proud I am of this show and more importantly, how proud I am of the bands who call Blacklight Media and Metal Blade Records their home. This is truly a once in a lifetime show for all of us and for all the amazing fans of these talented artists. Having Jose Mangin as the Master of Ceremonies is icing on the cake! 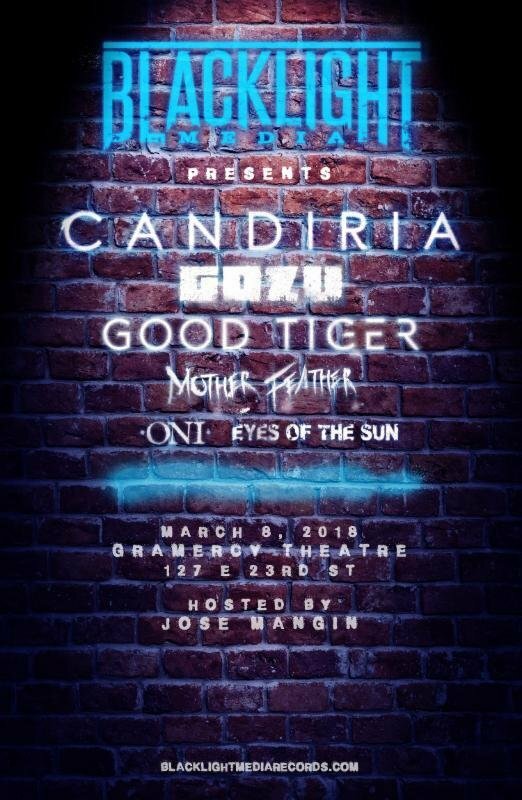 We can't wait to celebrate a night of crushing multi-genre Metal with you on March 8. Long Live Metal!" Formed in 2010, Gozu has released one EP and three full-lengths to-date, and are currently writing their fourth studio album, set for a 2018 release via Blacklight Media. Fronted by Marc Gaffney on vocals and guitar, Doug Sherman on guitar, Joe Grotto on bass, and Mike Hubbard on drums, the band's sound is tailor-made for blasting out the car speakers via international radio airwaves. Having already been aired on national television (USA) via MTV ('Road Rules', 'Dudesons', 'Real World'), NBC, and NASCAR, Gozu aims to take their critical and commercial success to new heights on their upcoming debut for Blacklight Media, with worldwide touring to follow. Previously, the group shared the stage with the likes of St. Vitus, Pallbearer, Lo Pan, Storm of Light, Helmet, Elder, Mos Generator, and Fu Manchu in the States, as well as Yob, Church of Misery and Kvelertak in Europe at Roadburn (Netherlands) and DesertFest Berlin (Germany). 2018 will surely see Gozu back on the road again, and at the forefront of the heavy rock and metal world. Eyes Of The Sun was conceived in early 2007 by bassist/vocalist Jeff Blanchard. Long-time friend Miguel De Jesus Jr. joined the ranks with Jeff a few months later on guitar. Within a few years, and after a couple of past members on second guitar and drums, Chris O'Neil joined as the permanent drummer. As a trio, they performed countless shows over the past 10 years, delivering their unique brand of doom metal - which leaves listeners with a range of emotions, that the band themselves then experience and extract from. The band explains:"It is known throughout the laws of science and nature that the sun creates and sustains life...Now it stands witness to the atrocities, depletion and vile consumption manifested by mankind, which it originally sustained life for. In our way, we portray what is seen through the Eyes Of The Sun."